Recorded at Sound Studios, Athens, Greece. All tracks composed, arranged, performed and produced by Vangelis. The only Vangelis solo-album to be released on the Arista label, "Direct" is the favourite album of many of his fans, due to its variety in styles, clear-cut melodies and rhythms, and the obvious joy Vangelis had in using a new device built specially for him under the supervision of technician Bill Marshall, which also goes under the name Direct.Whereas on other projects some extra-musical concept provides the inspiration for the music (obvious candidates being the imagery associated with movies, or a person: El Greco comes to mind, or a culture: homeland Greece, also for example China) and the instruments used are only a means to achieve the goal of expressing that concept, this time the more mundane object of the instrument itself provides the inspiration to Vangelis.And an inspiration it must have been, because the Direct instrument (a sort of hook-up device for up to eight separate synthesisers) served to realise Vangelis' long-term goal, when playing a new piece, of achieving a particular sound-picture, being continually able to change the combination of instrumental voices and immediately recording the piece, all in one take, without any overdubbing afterwards or programming beforehand (although, to be sure, it can contain presets, but these are optional). Two examples of what it makes possible are:-	Linking up a number of so-called arpeggiators (after the music-theoretical term "arpeggio"), which are sort of advanced sequencers that take their cue from what Vangelis plays on the keyboard they're connected to. A great example is the opening track 'Motion Of Stars' where a whole bunch of arpeggiators can be heard.-	Real-time control of the precise dynamical shape, in terms of harmony, loudness and duration, of the echo-effect (listen to 'Oracle' of 'Apollo' for a good example). This to achieve multiple layers of sound, where a note or chord struck on for example the piano, is virtually simultaneously echoed in other layers, like bass and/or strings. There can be a danger of over-relying on this effect (even a composer like Beethoven displayed the somewhat annoying habit of very often having the flutes play the same melody as the violins) but usually Vangelis is acute enough to not overdo it.Vangelis seems to have used this first opportunity to use the device to fill an album with pieces in a whole range of styles. A piece like 'Elsewhere' is reminiscent of the album "Opera Sauvage", the up-tempo 'Dial Out' is a sort of rock-piece, there's a bit of opera ( 'Glorianna - Hymn a la Femme' ), which actually sounds more like a lament than a hymn), 'Message' is great symphonic piece, 'First Approach' is one of those typical tranquil pieces and the wacky final track 'Intergalactic Radio Station' shows Vangelis in "See You Later"-mode again (the text recited by technician Casey Young appears to be a parody in two ways: of the Blade Runner-monologue by the dying Roy Batty and of the sequence read by Keith Spencer-Allen and, much to his dismay, used on the "Albedo 0.39" title-track). So an appropriate sub-title to this album could be "Vangelis plays Vangelis" - in fact, he said something like this in a 1988 interview.There are always two directions from which to approach an artist like Vangelis (from popular or from classical music) and both are represented on this album. Although, in my opinion, the balance clearly swings towards pop (i.e. a collection of shortish mostly single-tempo "tunes you can whistle" with plenty of percussion and things like sampled electric guitars), on the other hand there are also plenty of mock-classical things in it like pan-pipes, harp, organ, harpsichord (at the end of 'Ave') and of course the un-credited soprano Markella Hatziano in the one genuinely classical piece 'Glorianna'. 2000. 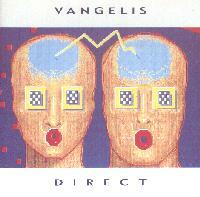 © Ivar de Vries It is stated that the album sees Vangelis using the 'Direct' device. In fact the Direct sequencer was not finished until after the album had been released, and does not feature on any of the tracks. 'The motion of stars' and several other pieces utilise the predecessor to the Direct, a device called the Zyklus MIDI Performance Sytem. Richard Clews A very special space album from Vangelis. One of my favourite. 2005. Theodoros Sotiropoulos / Greece In its variety Direct can be compared to Albedo 0.39. Some synth timbres are a little bit dated but this is Vangelis at his best anyway: all over the place, apparently able to make any kind of music. Highly recommended for Vangelis fans, but not the best place to start for a newbie - get Heaven and Hell, Albedo 0.39 and Spiral instead.